He was on his way to work; it was his final day as he was to resign and return home to Cofradia after working in Tijuana for a few months. The bus that Humberto was standing in with a number of other people flipped over killing 7 and injuring everyone else. His injuries were somewhat minor as he received a hit to the back of his neck/head which continues to give him pain; he did not expect to walk again as he felt numbness for a couple of days. As I asked him about the other passengers on the bus, he said there were people all around him with very severe injuries and went on to describe a few that I will leave out of this post (otherwise, I'd have to make this rated R!). 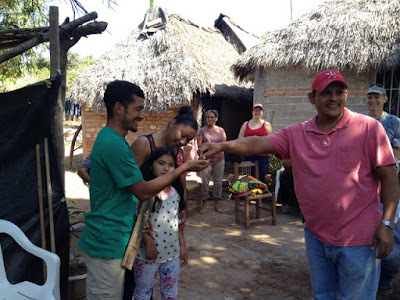 This happened just days after Cy-Fair Christian Church had selected Humberto and his wife, Choco, as recipients for the house they were going to Cofradia to build and already had begun to pray for them. 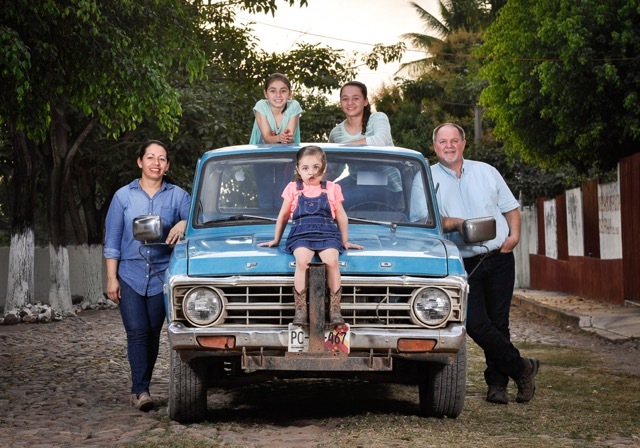 We all believe that it was God's hand on Humberto's life that kept him alive; it was also a great testimony to Humberto as he acknowledged that it was God who helped him through this. Humberto is from Cofradia as well as his parents and was part of the youth group a decade ago. His wife, Choco, is from the Cora indian village of Mojocuautla where Pastor Horacio visits each week for Bible Study. They have a seven year old daughter named Frida. They were given a piece of property from his parents, but did not have the means in order to build a house to live in. Meanwhile, they lived with his parents in an adobe walled, thatched roofed room on the back of the house. They had been on the list of candidates for two years. Standing in front of their old home when they first became candidates for Cofradia Dwellings. This was a great gift for a family who does not know Jesus. It's exciting for everyone to see the faces of recipients of homes and this was no exception! Humberto and Choco were so grateful and excited. 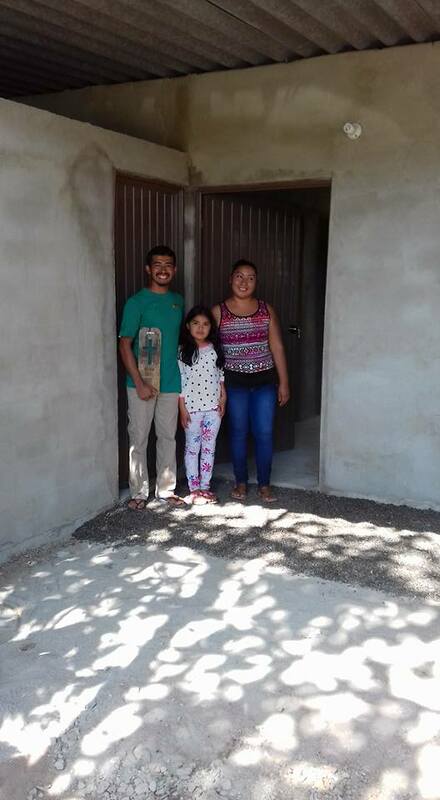 Humberto said that he didn't think he'd ever be able to build a house for his family and received this gift with a very thankful heart. This is so much like the gift of salvation. We do nothing to deserve salvation; salvation is not earned as so many think so. It is an unconditional gift. This house was an unconditional gift. Humberto receiving the keys to his new home. Panoramic...this is a typical house we've built with a small kitchen added to the front porch. We have a special gathering for each home built as we dedicate it to the family. This is one way to reach a family. This is one way to share God's love. Come and bless a family by building them a house and you will be blessed! We are excited about our new design for a house that will accommodate a family much better. It includes two rooms, a living room with dining and kitchen area, a bathroom and water cistern. Click here to a layout of the new design and the current families who are in need of a home. Put together a team today and contact us! A good size team is 10-15 people to build a house in one week. Greetings from Cofradía, Mexico! Will you please join us in prayer for our friend, Gerardo? He is a Pastor in Bakersfield and has been diagnosed with an aggressive cancer. They have transported him to MD Anderson Cancer Center in Houston. He has two young daughters. Thank you! Bible College: Thank you for your prayers. We are working on a new format. 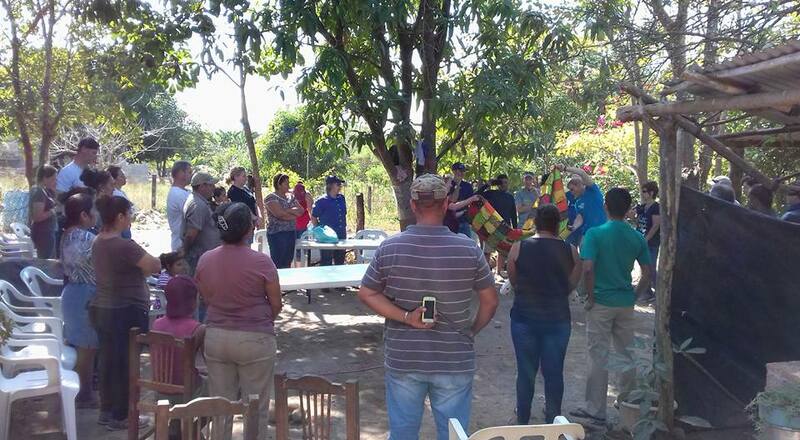 Short-term Mission House Build: Cy-Fair Christian Church came to Cofradia to build a house for a young family in need. They were a great team and did a great job! We have not been able to post a short report. If you have facebook, you will see a number of posts on my wall about the family and a time-lapse video from one of the team members. Humberto and Choco were extremely excited to receive the house. It was so fun to see their faces light up! Great example of Christ’s unconditional love. Thank you, Cy-Fair! Freedom in Christ Seminar: We had a wonderful time at our one-day seminar on Freedom in Christ. The experience is something that brings so much peace and it’s a great way to know God more, who we are in Christ and how Christ can work in us. Great stuff! Border trip. We leave on Monday morning, February 13, to California for a few days in order to renew our truck permit. We will be travelling through Arizona and I’ll make a quick trip to Bakersfield and Oxnard. Would love to see any of you in those areas! Pastors’ Perspectives (NEW): Click here to read bi-annual reports from three of our Pastors. CENTRO CRISTIANO COFRADIA’s Facebook page (NEW) "Like" us on Facebook to see what's happening. Cofradia Dwellings Candidates: We are currently interviewing a number of families in need and will be placing their profiles on our blog. Come on down and build a house with us! Click here to see three families who are in need of a home. 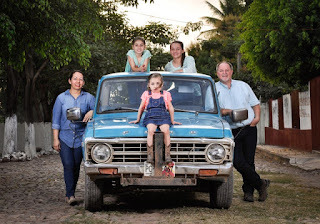 EL RETO: If you missed any of the reports or are curious about EL RETO, click here to see the latest. Cofradia’s Short-Term Missions Manual explains more of our mission in detail. Click on this link to check it out. Border trip. We need to make a trip to the border to renew our truck permit. We will be leaving on Monday, February 13. Please pray for safe travels, divine encounters, and that we’d be able to acquire the things we would like to get for the ministry. Drummers’ Workshop: March 4, our friend Hernan Mercado will be here to give a workshop for those interested in learning how to play the drums. Pray for us as we disciple these new worship leaders. Church Anniversary: We will have a special guest speaking on March 4 and 5 as we celebrate 6 years in the new building. This Freedom In Christ material by Neil Anderson and Steve Goss is designed as a 13 week discipleship course. The content is great as it enlightens you to the truth of who you are in Christ, it challenges your faith to grow and walk in the power of God that is in you through Christ, and it guides you towards a daily life full of victories in Christ. We had 17 people attend our one-day seminar from three different churches. We reduced it to four different sessions in order for more people to be able to make it and after the four sessions we led everyone through a number of practical steps of repentance, forgiveness, and renouncing that help us experience freedom and a renewed mind. The peace of God is incredible!